This ancient science’s goal is to restore health by bringing the body into balance and harmony. Comprehensive diagnosis is based on theories of Yin and Yang, Qi and the Five Elements. Pathways composed of life force (Qi) move through the body along meridians. Energy in the body may become blocked, stagnant or sluggish due to trauma, poor diet, medication, stress, hereditary conditions, environmental factors, and excessive or prolonged emotional issues. Pain or sickness may result. Removing the block and stagnation is necessary for healing. In TCM, the focus is to correct the root cause of illness versus the symptoms in order to produce lasting results. What does a TCM consultation by Dr. Natasha Grbich include? Tui Na is deep tissue bodywork and an excellent alternative to Swedish massage. 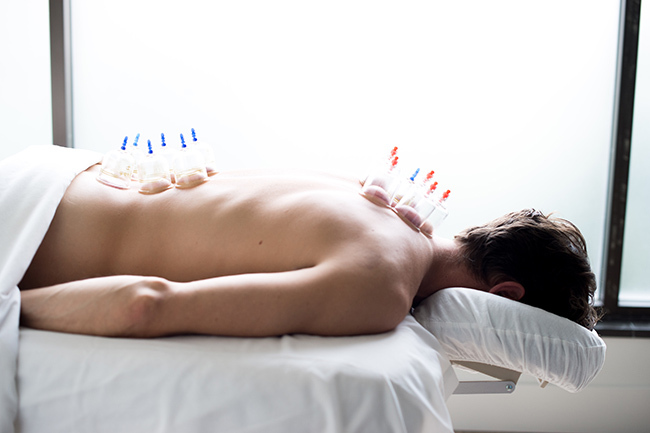 The focus is on pain sites, acupressure points, muscles, joints, and meridians. Tui Na works in accordance with TCM and as such supports broader health goals than those attained by a typical massage. Cupping is a therapy that dates back thousands of years and was used by the Ancient Egyptians, Greeks and Chinese. This treatment gives a superb massage, breaks down adhesions, increases energy flow and improves circulation. Multiple cups are placed on the area to be treated. By using heat or suction, a partial vacuum is created and tissue is pulled up into the cup. A thin layer of oil is administered, the cups are placed, and suction is applied. The cups are moved usually up and down the back (erectors), shoulders, and hips. Usually no oil is used and the cups may be placed on most areas of the body for 1-15 minutes depending on the condition. Note: Colour on your skin from the cups is normal. The more toxins in the body the darker the colour will be. The marks may take 7-10 days until completely resolved. A three treatment cupping protocol is beneficial once per year to help cleanse the liver and toxin areas. Moxibustion is the burning of a herb called Mugwort for therapeutic purposes. When burnt, Mugwort helps to break stagnation, clear phlegm, and rectify the qi and blood. Practitioners use moxa to warm regions and acupuncture points with the intention of stimulating circulation through the points and inducing a smoother flow of blood and qi. Gua Sha is also known as scraping, spooning and coining and is most commonly used for treating pain. Using an instrument, the practitioner press-strokes in one direction on a lubricated area of the body surface. This causes blood to diffuse through the surrounding tissues and creates transitory therapeutic petechiae called ‘sha’ (minute discolored spots). Gua Sha promotes microcirculation, lymph flow, removal of toxins, and stimulates the immune system. For a more detailed description and information on recent research.